Find artworks, auction results, sale prices and pictures of Mariotto Albertinelli at auctions worldwide. 23 3/8 by 18 1/2 in. ; 59.5 by 47 cm. Anonymous sale, New York, 18 January 1983, lot 31. K. Garlick, "A Catalogue of Pictures at Althorp", in The Walpole Society, 1974-1976, vol. 45, Glasgow 1976, cat. no. 614 (as Giovanni Antonio Sogliani). This beautiful Madonna and Child beside a window was painted by one of the leading protagonists of the early Florentine Renaissance, Mariotto Albertinelli. The artist trained under Cosimo Rosselli alongside Fra Bartolommeo, with whom he set up a workshop in the 1490s. Albertinelli and Fra Bartolommeo appear to have been close friends and the two operated under an equal partnership, dividing proceeds from their commissions in half. In certain collaborations the two hands are inextricably intertwined, working so closely that it can be difficult to decipher the work of one from the other. In Albertinelli\’\’s independent works, however, his painting style diverges from Fra Bartolommeo, favoring more subtle chromatic shifts, and faintly archaic forms as evidenced in the present painting. The soft contours of the flesh are formed with an almost hazy sfumato effect, evading the stronger chiaroscuro preferred by Fra Bartolommeo. The transitions of color in the drapery, with diffused highlights, have not yet taken on the Peruginesque quality that we see in Albertinelli\’\’s later works. The artist has taken great care in the representation of the draped curtain: cross-hatched lines along the main fold at left denote the sheen of precious metal threads in the cloth-of-gold lining, and the embroidery is finely painted in raised lines, creating a tactile surface. The landscape shown through the window at right is painted with a remarkable looseness. The trees, some fine and long limbed, others made full with layered rows of browning leaves, are reminiscent of those in the background of Fra Bartolommeo\’\’s Noli Me Tangere, now in the Musée du Luovre, Paris (inv. no. 39). 147 by 116 cm. ; 57 7/8 by 45 5/8 in. 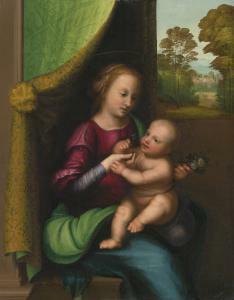 Few works by Albertinelli, one of the greatest exponents of the Florentine High Renaissance, remain in private hands. This example, which has the unusual distinction of being both signed and dated, has remained in the same family collection since its acquisition in 1825. This hitherto unpublished, signed and dated panel is a rare addition to the catalogue of Mariotto Albertinelli, one of the protagonists of the High Renaissance in Florence. 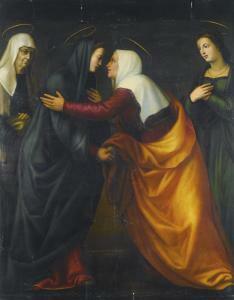 The painting is an autograph variant of his most celebrated work, the Visitation in the Uffizi, Florence (see fig. 1), which is dated 1503 but is not signed. The Uffizi altarpiece was conceived with three predella panels showing different episodes from the life of the Virgin and was painted in 1503 for the Florentine church of Santa Elisabetta (formerly known as San Michele), deconsecrated in 1785. The subject depicts the event narrated in the Gospel of Luke in which Elizabeth, Mary's cousin and pregnant with John the Baptist, visits Mary, who is also with child. Since it is the scriptural episode in which Elizabeth features most prominently, it is appropriate that it should have been the subject chosen for a church dedicated to her. 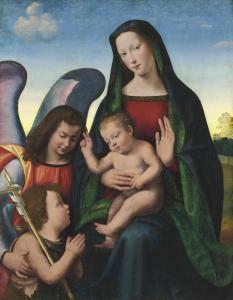 Just five years after executing the Uffizi prototype, which shows the undeniable influence of Perugino in its use of soft higlights and its inclusion of a classical arcade, the artist returned to the subject using the same cartoon but introduced some fundamental differences to the design: the architectural niche and the landscape have been removed and two additional figures have been introduced. While the central figures may wear robes different in color and detail from the prototype, they are very much faithful to the original in their harmonious pyramidal design which balances both movement and stasis. Interestingly, the face of Elizabeth in the present work is no longer in shadow as it is in the Uffizi version. After training with Cosimo Rosselli in the late 1480s, Albertinelli set up a workshop with Fra Bartolommeo, who had also trained under Cosimo. The close working relationship between the two meant that for many years some doubts remained over who had painted certain works. For example, the Kress tondo now in the Columbia Museum of Art in South Carolina was repeatedly given to Fra Bartolommeo but is now thought to be the work of Albertinelli using the former's cartoon. In the case of the present design it seems that Albertinelli again made use of his friend's ideas: though drawings of the Visitation by Albertinelli do exist, an album of works in the Louvre, which are unmistakably by Bartolommeo's hand, show that the present composition was first conceived by the friar. Moreover, the same album contains drawings by Fra Bartolommeo which provided the basis for Albertinelli's triptych from 1500 today in the Museo Poldi Pezzoli in Milan. After inspecting the panel in the original, Professor Andrea De Marchi has endorsed the attribution to Albertinelli and tentatively proposed that the lateral figures may be the work of Giuliano Bugiardini. According to Vasari, Albertinelli included a portrait of Bugiardini in the fresco of the Last Judgement in San Marco, which he took over from Fra Bartolommeo when the latter stopped painting for four years upon entering the Dominican Order. Bugiardini is known to have rented quarters next to Albertinelli in 1503 and began assisting him shortly thereafter. 1. Oil on panel, 232 by 146 cm., (inventory number 1587); see Gli Uffizi, Catalogo Generale, Florence 1979, p. 117, cat. no. P20, reproduced. 2. See A.R. Blumenthal (ed. ), Cosimo Rosselli, Painter of the Sistine Chapel, exhibition catalogue, Winter Park, Florida 2001, pp. 194–97, cat. no. 25, reproduced in colour. 3. For a further discussion see C. Fischer, Fra Bartolommeo et son atelier, exhibition catalogue, Paris 1994, pp. 60–66. 4. See M. Natale, Museo Poldi Pezzoli, Dipinti, Milan 1982, pp. 158– 59, cat. no. 199, reproduced. 57 7/8 by 45 5/8 in. ; 147 by 116 cm. (Possibly) The Gonzaga family, Dukes of Mantua, Mantua. Conte Gaetano Susanni, Mantua, by 1827; Hôtel Drouot, Paris, 28 February 1868, lot 37, as Francesco Francia. Alfredo Omfray, Naples, 1871. Mme. Baude, Paris, by 1891, by whom sold in 1894 to the following. with T. Lawrie and Co., London, by whom sold in 1896 to Theodore M. Davis, Newport, R.I., by whose estate bequeathed in 1930 to The Metropolitan Museum of Art, New York. Monumenti di pittura e scultura trascelti in Mantova e nel suo territorio, Mantua, 1827, pp. 1-2, pl. 1, as Francesco Francia. O. Mündler in C.T. Dowd, ed. 'The Travel Diaries of Otto Mündler, 1855-1858,' Walpole Society, LI, 1985, p. 155, entry from 27 May 1857, as Sogliani. J.A. Crowe and G.B. Cavalcaselle, A History of Painting in Italy from the Second to the Fourteenth Century, London, 1866, III, pp. 498-499 note 5, as Bugiardini. E.B. Andrews, 'Journal entry', 1 May 1897, in A Journal on the Bedawin, 1889-1912: New York, 1918, n.p., as Bugiardini. J. Breck, 'Dipinti italiani nella raccolta del Signor Teodoro Davis', Rassegna d'arte, XI, July 1911, pp. 114-115, as Bugiardini. J.A. Crowe and G.B. Cavalcaselle, A History of Painting in Italy: Umbria, Florence and Siena from the Second to the Sixteenth Century, London, 1914, VI, pp. 119-120, note 1, as Bugiardini. L. Dami, Vita di Giuliano Bugiardini, Florence, 1915, p. 36, as Bugiardini. A. Venturi, 'La pittura del cinquecento', in Storia dell'arte italiana, IX, 9, Milan, 1925, I, p. 426, note 1, as Bugiardini. B. Burroughs, 'The Theodore M. Davis Bequest: The Paintings,' Metropolitan Museum of Art Bulletin, XXVI, 2, March 1931, pp. 14, 16, as Albertinelli. B. Berenson, Italian Pictures of the Renaissance, Oxford, 1932, p. 119, as Bugiardini. B. Berenson, Pitture italiane del rinascimento, Milan, 1936, p. 103, as Bugiardini. H.B. Wehle, The Metropolitan Museum of Art: A Catalogue of Italian, Spanish, and Byzantine Paintings, New York, 1940, p. 61, as Albertinelli. B. Berenson, Italian Pictures of the Renaissance: Florentine School, London, 1963, I, p. 45, as Bugiardini. F. Zeri and E. Gardner, Italian Paintings: A Catalogue of the Collection of The Metropolitan Museum of Art, Florentine School, New York, 1971, pp. 188-189, as Albertinelli. B.B. Fredericksen and F. Zeri, Census of Pre-Nineteenth-Century Italian Paintings in North American Public Collections, Cambridge, 1972, pp. 4, 336, 607, as Albertinelli. S. Meloni Trkulja, 'Bugiardini, Giuliano', in Dizionario biografico degli italiani, 15, Rome, 1972, p. 16, as Bugiardini. L. Borgo, The Works of Mariotto Albertinelli, New York, 1976, I, pp. 160-161, 300-302, no. 14, fig. 21, as Albertinelli, possibly with assistance from Bugiardini. L. Pagnotta, Giuliano Bugiardini, Turin, 1987, pp. 28, 195, no. 9, fig. 9, probably a collaboration between Albertinelli and Bugiardini. A. Matteoli, 'Un'inedita 'Madonna' di Giuliano Bugiardini,' Storia dell'arte IC, May-August 2000, pp. 20, 22 note 13. G. Sarti, ed., Fonds d'or et fonds peints italiens (1300-1560), exhibition catalogue, Paris, 2002, pp. 172, 174, 178, 180, 182, 184-186 note 6, fig. 1, as 'Albertinelli and (or) Bugiardini' (entry by A. de Marchi). New York, Metropolitan Museum of Art, 1915-1930. London, Royal Academy of Arts, Winter Exhibition, January-March 1891, no. 109, as Francesco Francia. Trenton, State of New Jersey Museum, Christmas Exhibition, 19 December 1948-2 January 1949 (no catalogue). Winter Park, Morse Gallery of Art, Christmas Exhibition, 12 December 1952-12 January 1953 (no catalogue). Stamford, Stamford Museum, Christmas exhibition, 12-31 December 1954 (no catalogue). New York, The Metropolitan Museum of Art, Florentine Paintings in the Metropolitan Museum, 15 June-15 August 1971 (no catalogue).